OP3301. 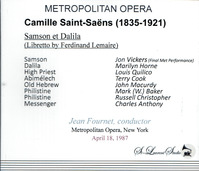 SAMSON ET DALILA (Saint-Saens), Live Performance, 18 April, 1987, w.Jean Fournet Cond. 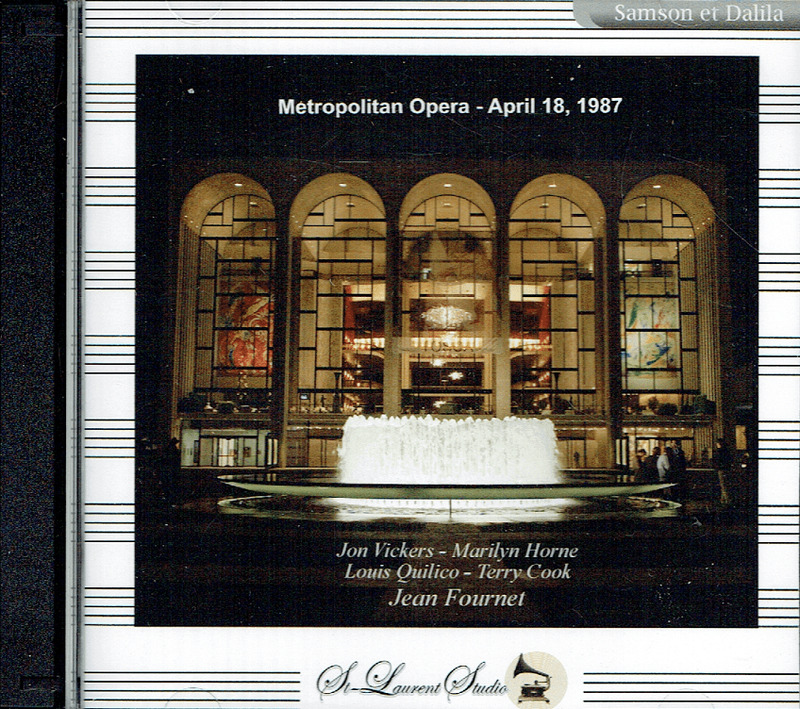 Met Opera Ensemble; Jon Vickers, Marilyn Horne, John Macurdy, Louis Quilico, Terry Cook, etc. (Canada) 2-St Laurent Studio stereo YSLT-804. Transfers by Yves St Laurent. 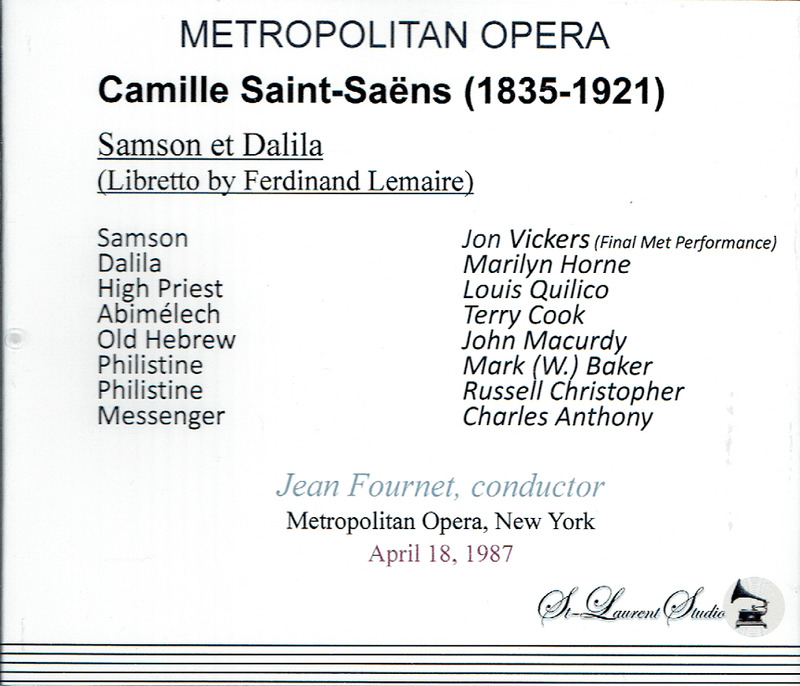 “SAMSON ET DALILA has a distinguished history at the Met. The first Samson was Francesco Tamagno (Verdi’s first Otello), and from 1915 to 1920 the role was owned by Enrico Caruso (his Dalilas included Margarete Matzenauer and Louise Homer. Later the prime Samsons were Giovanni Martinelli, René Maison, Ramon Vinay, Mario del Monaco, and Jon Vickers. Additional great Dalilas included Karin Branzell, Grace Bumbry, and surprisingly, two Italian mezzos who had little renown in French opera, Fiorenza Cossotto and Giulietta Simionato. In other words, SAMSON ET DALILA has been considered worthy of the attention of major opera stars. This is not surprising, for despite some structural flaws and passages that do not rise above the commonplace, the title roles are filled with juicy moments during which great singers can demonstrate their skills. In Jon Vickers we have a truly extraordinary artist who is fully up to the technical, musical, and dramatic demands of Samson. (Vickers is probably one of the very few tenors capable of singing the role of Samson in either Handel’s or Saint-Saëns’s operas, both of which he performed at the Met!). This performance was his final one at the Met, at the age of 60, having sung 280 performances of 17 roles there since 1960. You would have no hint of his age, however, from the condition of his voice. Not only is the top of his range solid, but he is completely comfortable in that difficult area known as the passaggio between the middle and upper registers, where Saint-Saëns actually puts a good deal of his writing. Vickers sings potently at full volume, beautifully in soft passages, and with enormous variety in between. The role calls for long, sustained lines, and he provides them with no sense of struggle. This is a performance of immense power and at the same time great subtlety. There are other recordings of the opera with Vickers, notably a live performance from 1964 with the same conductor and the lovely Mexican mezzo-soprano Oralia Dominguez (on the Gala label) as well as an EMI effort with Rita Gorr, but as a souvenir of the tenor with an entire career of experience behind him and all the wisdom the years had built, this account is irreplaceable. There is much to admire in Marilyn Horne’s Dalila too, though one must also admit that she is not a natural for the role. The first requirement of Saint-Saens’s music is opulence of tone. Dalila is a temptress, and the writing for her is exquisitely seductive. Horne’s voice is more forceful and tightly focused than it is sumptuous. But it must also be noted that she was one of the most intelligent singers of her generation, and she wisely modulates her voice in much of the role. In Dalila’s exchanges with Louis Quilico’s High Priest, Horne could unleash her power, while in the arias and duets with Vickers she does a good job of scaling back the edge that is a part of her timbre. It is apparent throughout her performance that Horne is a major artist with an important voice that is worth hearing in anything she undertook, and her chemistry with Vickers is electric. If not the last word in voluptuousness, her portrayal provides significant pleasure. The same can be said of John Macurdy’s Old Hebrew but not of Louis Quilico’s blustery, gruff High Priest. The remainder of the cast is more than adequate, and the chorus and orchestra perform very well under the baton of Jean Fournet. The Metropolitan did not always hire appropriate conductors for the French repertoire, but in this case they did. Fournet’s touch is sure from the first notes. The orchestral sonority is transparent and delicate throughout, even in the wild Bacchanale, which must have been danced spectacularly, because it gets the longest ovation of the evening.